Well, we did not take a picture this past Sunday. 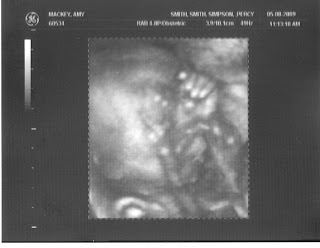 So now here I am 23 weeks and 3 days and it's Wednesday and still no picture, so I'm just going to post without one! We had a very busy week last week! Randy's parents came in Wednesday and were here until Sunday! It was wonderful to see them. We've never really spent time alone with them and that was very special because who knows if and when we'll get to do that again! Then.... Randy graduated on Thursday! He's officially an army diver :) YAY! Friday was our appointment and everything went great. Little boy wouldn't move his hands or feet from his face to get a good shot. But he's measuring good. 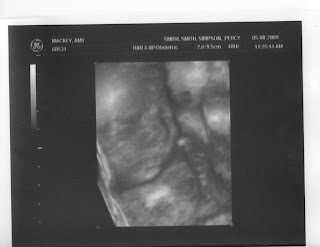 He was weighing about 1 pound and 6 ounces. I gained WAY too much weight this past month so I'm really watching it. As soon as we get to VA I've got some nutrisystem left so I'm going to do that for about a month to try to level it out! Very frustrating and dishearting! I wish I could be one of those TINY women pregnant and be adorable, guess not! And on Julietta and the ocean Randy just grabbed her on Friday and took her out, and she loved it! They were jumping the big waves. It's all she can talk about! We saw a pack of about 20 or more dolphins that were SO close. Randy was right up on one! That was pretty amazing! Then Sunday was mothers day, and Randy took his parents to the airport while I finished some school work. Then for dinner we went and got chinese. I have been craving Chinese food since we moved down here and we haven't found a place. So finally we went searching and it was AMAZING! So this next week is going to be VERY busy. We are packing up and leaving Sunday. We will get as far as we an that night and then make it the rest of the way to mom's on Monday. Then get all our baby stuff and leave Jules at mom's house and get to VA on Tuesday. Pray for us that we can find a place fast! 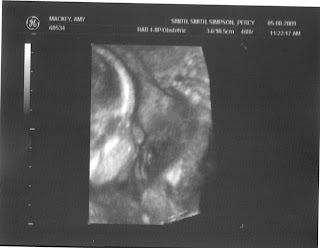 So, I'm going to post some of the ultrasound pics and some pics with Randy's parents. I don't have a ton, his dad took a lot so I'm waiting for them to send them to me. Also there's a picture of Randy and I at his graduation. I look HUGE! I don't look that fat in person but it's the only one I got! Turn on the radio and sway to the music. With his sense of movement well developed by now, your baby can feel you dance. And now that he's more than 11 inches long and weighs just over a pound, you may be able to see him squirm underneath your clothes. Blood vessels in his lungs are developing to prepare for breathing, and the sounds that your baby's increasingly keen ears pick up are preparing him for entry into the outside world.